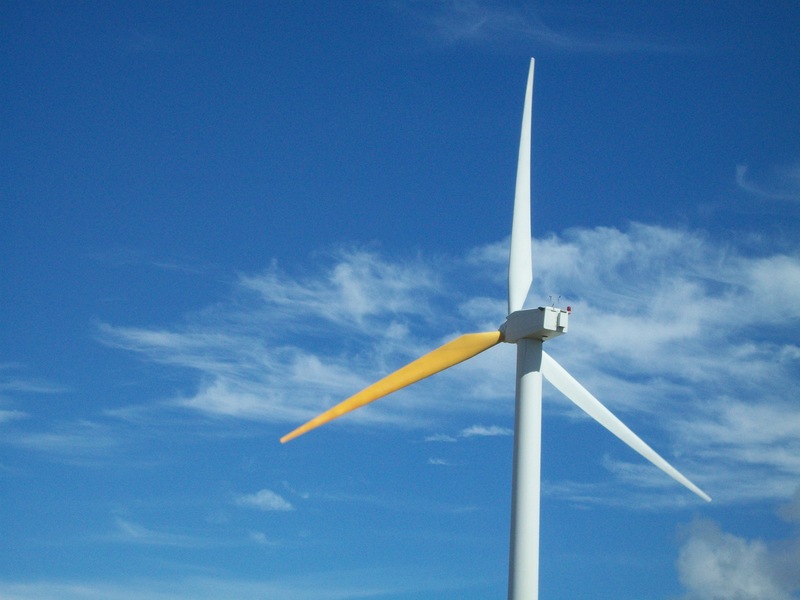 Wind Turbines Generate Electricity and Controversy: a series on whats in the wind. Opponents objections and concerns regarding wind turbines can be listed in eight distinct categories: Visual, Noise, Intermittent Power, Bird/Bat deaths, Altering Vegetation, Fire, Ice and Pollutants. In this article, Wind Farm – Cons, Part 4 the discussion is Fire, Ice and Pollutants. You may have missed the news that April 3rd 2012 was International Protest Day Against Wind Turbines. The Ontario Wind Resistance web site announced “On April 3rd, 2012, groups from Ontario will mobilize to show their discontent. In Germany other groups will act in various ways to express their solidarity with their Canadian colleagues, and with all the others that are fighting against wind power fascism across the world.” They claim that there are 2,800 citizen groups fighting the corruption, the speculation and the violence to populations carried out in the name of wind power. 745 Supporter websites are listed as participants. Quixotes Last Stand posted pictures and video of a protest march at the Canadian Auto Workers by citizens of Port Elgin, Canada that want a wind turbine erected at the auto plant removed. Reading the comments at the tail of these web sites and following links gives a clear picture of the state of mind of these protesters. With so many groups opposed to wind power there must be some basis for their concerns. As discussed in previous posts many individuals are being misled by pseudo science, alarmists and moneyed interests but fear and personal safety are legitimate concerns that should not be taken lightly. Photographs and video are now widely distributed of wind turbine fires that look extremely dangerous and reports of ice being hurled as if from a catapult would frighten anybody. 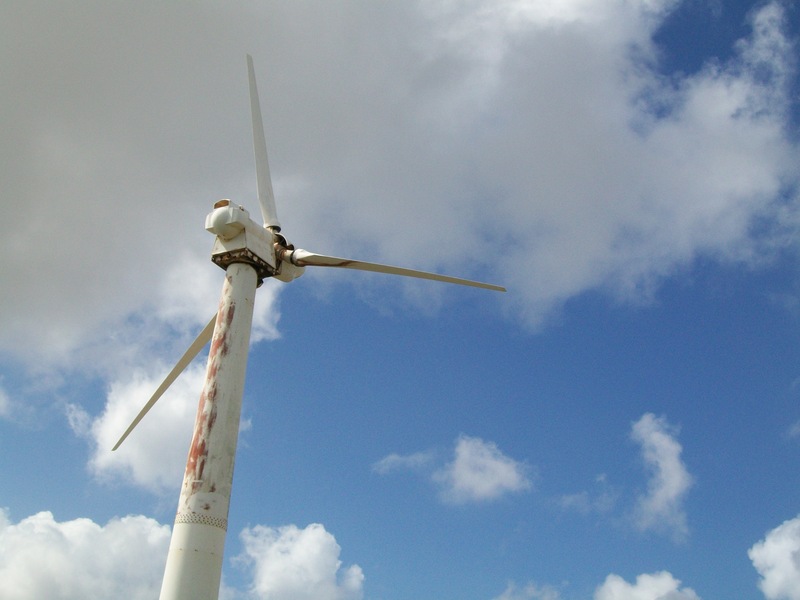 A wind turbine on the home of Texas State Representative Susan King experienced mechanical failure in October 2011. The turbine’s blades continued to spin even as the engine sparked, ignited and spewed gouts of flame across a two-acre swath of the senator’s property. Crews responding to the emergency needed eight trucks to contain the blaze. On Christmas Eve 2005, a wind turbine at the Nissan car plant in Sunderland, UK caught fire at the top, spreading slowly to the sails before finally burning out. Both lanes of the nearby A19 trunk road had to be closed to traffic because of the danger caused by the wind turbine fire. The towers of the wind turbine are 200 feet high, so they were not accessible to fire crews.Eventually, all 3 of the 75 foot long blades, or what was left of them, dropped off.The 6 wind turbines were bought second hand from Germany, and there are many reports of fires in other turbines on the Internet. Wind turbines in the Netherlands,Palm Springs CA, Hornslet near Aarhus, Denmark, and Burgos in Spain have all had accidents involving fire. Reported by WAG (Wind Farm Action Group). In a December 2009 incident in Uelzen, Germany, a fire occurred in a wind turbine at a height of 130 meters (427 feet). The fire department closed off the the area and allowed the fire to burn out because it could not fight the fire at that height and had no other choice. In recent years, China has seen many cases of wind turbines catching fire, as more and more wind farms go into operation. Chinese wind farms largely keep only a number of portable fire extinguishers in the turbine engine room and the bottom of the wind tower. The ground-based fire fighting apparatuses are helpless to control fire burning in the engine room, because they cannot reach the height. December 2011 at Ardrossan, North Ayrshire, Scotland, a turbine exploded, spewing large pieces of flaming material on the ground below. 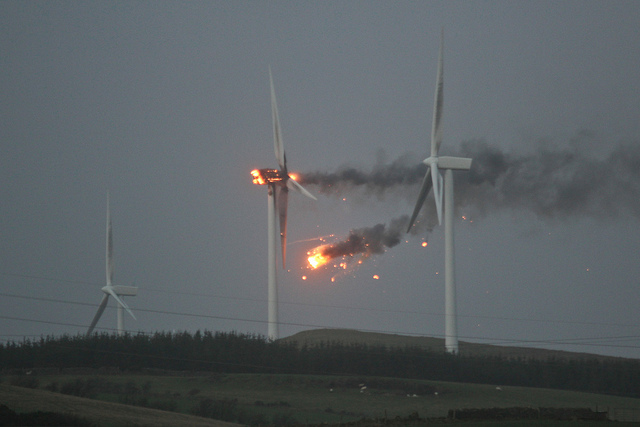 In a statement,The windfarms operator, Infinis of Edinburgh said: “Infinis confirms that a nacelle on a turbine at its Ardrossan wind farm caught fire in extreme stormy weather conditions. Stuart McMahon a local photographer from Ardrossan captured amazing pictures the moment the huge wind turbine erupted in flames. When turbine fires do occur at these massive towers, often 300 feet high there is little local fire departments can do. They have no equipment or hoses available that can reach the blazing nacelle as it burns out of control. Wind turbine closed after showering homes with blocks of ice. GE one of the major manufactures of wind turbines in the United States acknowledges the danger of ice throw in their own literature. The accumulation of ice is highly dependent on local weather conditions and the turbine’s operational state. Any ice that is accumulated may be shed from the turbine due to both gravity and the mechanical forces of the rotating blades. An increase in ambient temperature, wind, or solar radiation may cause sheets or fragments of ice to loosen and fall, making the area directly under the rotor subject to the greatest risks. In addition, rotating turbine blades may propel ice fragments some distance from the turbine- up to several hundred meters if conditions are right. Falling ice may cause damage to structures and vehicles, and injury to site personnel and the general public, unless adequate measures are put in place for protection. Wind turbines are causing deadly pollution. Lloyd Mcgraw, Consumer Energy Report, April 21, 2010. The natural gas industry has produced a new report which claims that increased use of wind energy cause coal-fired power plants to “cycle” unconventionally and thereby cause an increase in the pollution levels they traditionally produce along Colorado’s Front Range. Bentek Energy LLC, a consulting company, for the Independent Petroleum Association of Mountain States, conducted the report titled “How Less Became More: Wind, Power and Unintended Consequences in the Colorado Energy Market”. …Save Our Seashore 3/29/10 The report says that the greatly increased use of wind energy in the past few years may have raised pollution levels from coal and natural gas-fueled power plants owned by Xcel Energy Inc. That’s because the frequent change in output asked of power plants, in response to the availability of wind and solar power, adds to pollution, the report says. Manufacturing a turbine will cause some pollution, assembling, erecting and connecting the turbine to the grid will cause some more. Servicing and maintenance of the turbine will also have a certain environmental impact. Running the turbine will generate noise and shadow flicker, which some people refer to as pollution. THIS IS SAVING THE PLANET? The instances of wind turbine mishaps and accidents reported above are undisputed fact. It is true that turbines have caught fire. Yes ice can form on the tower and blades of turbines and fall off and yes some generators have permanent magnets that use neodymium a rare earth metal and yes again the manufacturing, transport and assembly does produce pollution. Because of these accidents and consequences at wind farms they get a big X by those critically opposed. In truth the cons are eXaggerated. You may have seen this picture. Photographer Stuart McMahon, who took the incredible image said “These are huge structures and to see one on fire was a spectacular sight.” He said the blades on the 100m mast were not turning when he arrived. “The fire must have lasted 15 or 20 minutes until the fire brigade turned up to put it out” By then the fire had stopped. No personnel were injured. This accident occurred when a freak storm that ripped across Scotland with 165mph winds, brought the country to a standstill, trucks had been tipped over, it knocked out power to 50,000 homes, caused roads, bridges and ferries to be closed. A Google search for images of the Ardrossan wind farm fire shows 110,000 results! Don’t be conned, it was one turbine, one fire. The Susan King home in Texas had a turbine fire with eight trucks required to battle the blaze? It included three different volunteer fire departments (she is a Texas State Representative) that quickly contained a dry grass fire that burned two acres. At the Sunderland, UK Nissan fire crews set up a cordon on the A19 road (because visibility was poor due to smoke) and the 3 blades dropped off into a field and burned themselves out. A local resident said worry about the tower collapsing on the road was unlikely as the towers are 55m tall and the set back is 85m (1.5 times the height) which had been determined to be safe by the local council. Blue Knob – Fire destroyed a windmill turbine at the Allegheny Ridge Wind Farm on top of the mountain. Lilly fire chief Robert Crum said it’s impossible to fight a fire at a turbine 250 feet above the ground, so firefighters set up a perimeter for safety reasons and extinguished brush fires that started when hot embers fell to the ground. That is how it is done. Set up a perimeter a safe distance from the base of the turbine and as any burning embers fall to the ground they can be quickly extinguished. Many modern turbines now incorporate automatic fire suppression systems within the nacelle further limiting any danger. In the past 40 years 185 incidents of fire have been reported at wind farms. Compare that with 369,500 U.S. house fires in 2010, reported by the national Fire Protection Association or 15,000 yearly clothes dryer fires according to Consumer Reports. The Confederation of Fire Protection Associations in Europe (CFPA E) support renewable wind energy projects and has prepared the Wind Turbines Fire Protection Guideline that gives solutions, concepts and models to facilitate safety and fire protection work in associated European countries. FIRE.What causes turbines to catch fire and how many fires have there actually been? The potential for fires is actually very low. They may be caused during construction or during maintenance by workmen. They can also start from sparks that emanate from turbine electrical equipment or lightening strikes. A popular site used by many anti-wind farm activists is the Caithness Wind Farm Information Forum. 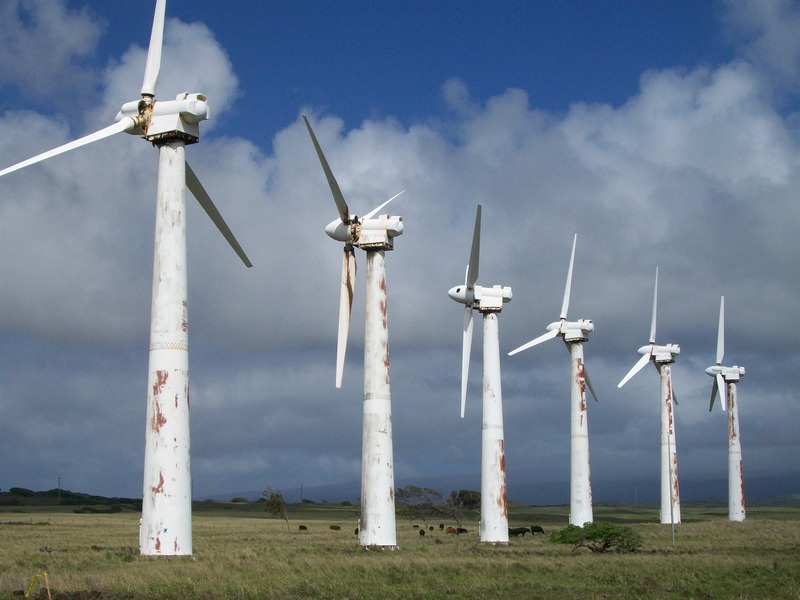 Statistics for every type of wind farm accident reported are categorized. They have actually compiled an extensive resource of 100 pages if you care to take a look.. Caithness lists 185 fires for wind farms since 1970. This number is not actually turbine fires but all fires reported at wind farms. A short review of the statistics reveal that a number of these fires reported are telephone poles, electrical panels and fires from other sources. 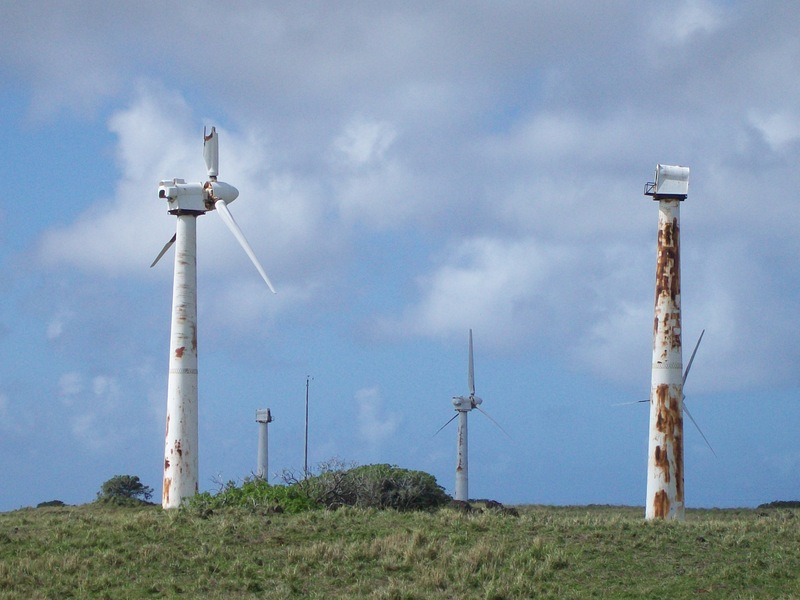 Further review indicates many are non-industrial or very old model turbines. Caithness statistics include any type fire reported at a wind farm weather it be a welding incident, encroaching grass fire or human error. Equipment failure and lightening strikes do happen but are quite rare. There are approximately 165,000 turbines in operation today. Calculating a high estimate of 200 incidents (in 40 years) would equal 0.00121% chance of a wind turbine catching fire. ICE. If fire is actually an infrequent occurrence at wind turbines what about ice throw? First of all turbine ice accumulation is limited to only those wind farms located where winter storm conditions or extremely low temperatures exist. Secondly engineers have minimized ice build up problems when designing the blades and by adding special coatings to the surface. A third mitigation strategy now used is the incorporation of heaters in the blades and mechanical components. 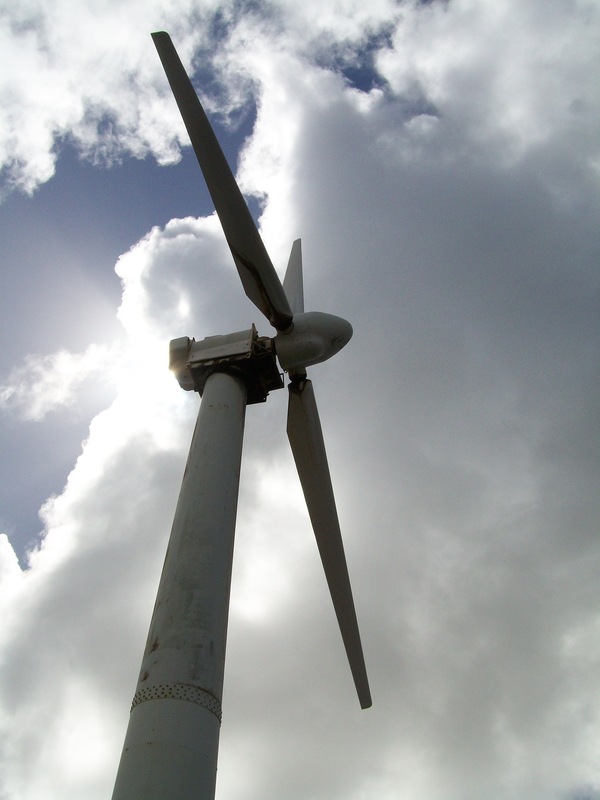 Technical solutions for wind turbines operating at low temperatures and in icing climates are available. The International Energy Agency has published a report State-of-the-Art of Wind Energy in Cold Climates that provides guidelines and recommendations. Ice can and does build up on turbine blades, however there are sensors in the mechanism that will detect any imbalance and automatically shut down the turbine. When the temperature rises either from the sun or heaters, ice begins to drop or be shed from the blades. The area directly below the turbine is the most affected by ice shed similar to any other building, tower or trees in the forest. Opponents of wind energy like to site the mathematics and physics equations of Professor Terry Matilsky, Department of Physics and Astronomy at Rutgers University. He can mathematically demonstrate how a perfectly formed Frisbee shaped piece of ice at the tip of the uppermost blade traveling at peak rotation velocity can sail a considerable distance. Its possible but highly unlikely. For more info about ice throw and an excellent no-hype article read this issue of Windletter by Mike Sagrillo. If you are concerned of danger from ice shedding at wind turbines it is best to follow the advice of GE – do not walk directly under or go hiking near turbines during an ice thaw. POLLUTION. The manufacture, construction, transportation and assembly of wind turbines create pollution. Lets just skip this argument as unworthy of consideration. The manufacture, transportation, etc. of any product is going to produce some pollution. Turbine manufacturing is not a particularly dirty business and any impact is usually negated in three or for months of clean energy operation. The claims of shadow flicker, visual and noise pollution are more appropriately labeled a personal annoyance than being harmful to the quality of air, earth and water and make for a poor argument. Another dubious claim is that the “cycling” at power plants caused by wind farm energy production increases CO2 . In particular the study done for the Independent Petroleum Association of Mountain States by Bentek LLC in Colorado has been proven to be controversial. Any claim that adding wind energy to the power grid would not reduce carbon dioxide emissions violates the laws of physics. Whats the story with neodymium and rare earth metals used in turbines? Turbine generators that have permanent magnets in the assembly undoubtedly use neodymium. Neodymium magnets are the strongest permanent magnets known. Although neodymium is classified a “rare earth” metal it is widely distributed in the earths crust and is no rarer than cobalt, nickel and copper ore. Discovered in 1885 neodymium was first used commercially as a glass dye and still has some applications for tinted glass today, including use in goggles, some lasers and spectrometers. Primarily it is now used because of its super magnetic quality and mass to weight ratio. It is used in such products as microphones, loudspeakers, headphones, cell phones, computer hard drives, televisions, welding clamps, oil filters, battery operated tools, clasps of all types and also MRI technology, electric motors and generators in automobiles, airplanes and wind turbines. Neodymium is mined in the United States, Canada, Brazil, India, Sri Lanka and Australia. The main mining areas are in China where the government has an abysmal record of environmental protection. In conclusion I would say anti-wind farm activists are using fire, ice and pollution as a con. Are these three elements dangerous at wind farms -yes. Do accidents happen-yes. Are they being eXaggerated-yes. Be wary of the hype, 110,000 images posted of one fire is still only one fire. I believe that engineers and designers would not willingly jeopardize million dollar projects carelessly and development of safe and efficient technologies continue to be implemented. To find out more about wind farms, how turbines work, the environmental and economic impact and lots more information read up on Wind FAQs. This entry was posted in Air, environment, Fire, politics and tagged Earth, environment, Politics, sustainable. Bookmark the permalink. A lot of information, well presented. It is great to see a voice speaking out on such important issues. Echoing others I really appreciate your thoughtful and comprehensive article. There really is no ‘clean’ energy but there are some that are much better than others. I watched “Cape Spin” recently and still your article presented new information to me, or at least I was able to understand it differently. I wonder if everyone had to choose an energy source that they would put in their backyard what they would choose and how those choices would affect their energy use. Thanks for educating me on the reasons why there seems to be such a fuss about these wind farms. I have a much better understanding of the rational (?) reasons why communities are opposed to them, but I somehow can’t help feeling that the real reason the neighbours are up in arms is because they believe that these turbines will spoil the view. It’s these less righteous, hidden agendas that perhaps make people cling so tightly to 110,000 images of a single fire. The toughest objections to overcome are the ones no one speaks out loud. Unfortunately mom, the image of people really only fighting wind turbines because it will spoil their view is part of the wind industry’s agenda to discredit wind opponents. I know here in Ontario, we have had well over a hundred families across the province who have abandoned their farms / rural homes to get away from the harm that the infrasound from industrial wind turbines are causing their families. These people then have to pay twice for a place to stay (their original home and their ‘shelter’ home). They have to pay twice the taxes, twice the home insurance, twice the utilities. No one in their right mind would do such a thing without one heck of a darned good reason and very few people can afford it. The financial hardship this creates for these families only adds to their already over-turned lives. But they have no choice. It’s stay where they are and everyone gets sick, or they find a second home. Most times, they can’t sell the first property, because no one else wants to live there. On the odd occasion the wind developer has purchased the property, but then the seller has to sign a gag agreement that they’ll stop saying negative things about wind turbines. Yes, I will admit there are some areas where people don’t want their view spoiled. Those are in the minority, as almost every anti-wind person I have met is very pro-renewable energy. But really, who can blame them for not wanting their view spoiled. People who live in the country, often pay premium prices to live there, specifically because of the view, the tranquility, the peace and quiet and for the quality of life. When you suddenly find your home surrounded by 500 to 600 foot tall industrial power generators (and let’s be real here … that’s exactly what they are), so that no matter which direction you look, all you see are these massive machines, who wouldn’t be upset about that? I’m heartened to hear about people like yourself who are open-minded enough to read about the problems with wind turbines, as opposed to those who just stomp their feet, put their fingers in their ears and refuse to listen or understand. So thank you for being interested. Excellent post. Thank you (and JP at The Green Word for the referral). Like all other non-renewable resources, we will run out of neodymium one day; but I cannot think of a better use for it than in the generators of wind turbines (where from it can be no doubt also be recycled). As for claims that defy the laws of physics, I would add to that list the suggestion that it could ever make economic sense to send space probes to recover rare metals from asteroids! Would it not make more sense to just repair a few diplomatic bridges with China; and encourage it to improve its environmental record? If anyone else is like me and would have had to shrug their shoulders and say “I dunno” if asked how dangerous is neodymium?”. You can start your journey to enlightenment here (i.e. the answer would appear to be “very”). Martin and JP, thank you for bringing pertinent information to the discussion. Thanks, nice to see a balanced view on this charged issue. If an offshore wind turbine catches on fire and the blades fall of, the worst that can happen is that a passing fish or lobster gets squished. If an offshore oil well catches on fire, like in the Gulf of Mexico two years ago, an entire aquatic ecosystem is damaged (possibly taking decades to recover), and entire fishing industries are crippled. Out of the two, I’ll take the squished fish 10 times out of 10. Like mabbsonsea said, “you don’t get something for nothing”. There will be costs, risks and environmental impacts associated with every form of energy production. The best we can do is choose the means of energy production that minimize those costs, risks and impacts. Wind may not be perfect, but, in my humble opinion, it is much better than anything the fossil fuels and nuclear industries have ever come up with. Once again, great work Dohn! As I’ve said to McEff, this is a very good point, JP – and I love your squished-fish-versus-ecocide illustration of it. A refreshing wind of sanity and a well-argued article, Dohn. What people seem to ignore when attacking wind farms is that the threat and actuality of pollution, fire and danger is far, far greater in the more traditional fields of electricity generating. Deaths in coalmining and offshore oil and gas production run into many hundreds, if not thousands, every year. Pollution is greater and more damaging. What do people want to see in the field behind their house if they don’t want a wind farm? 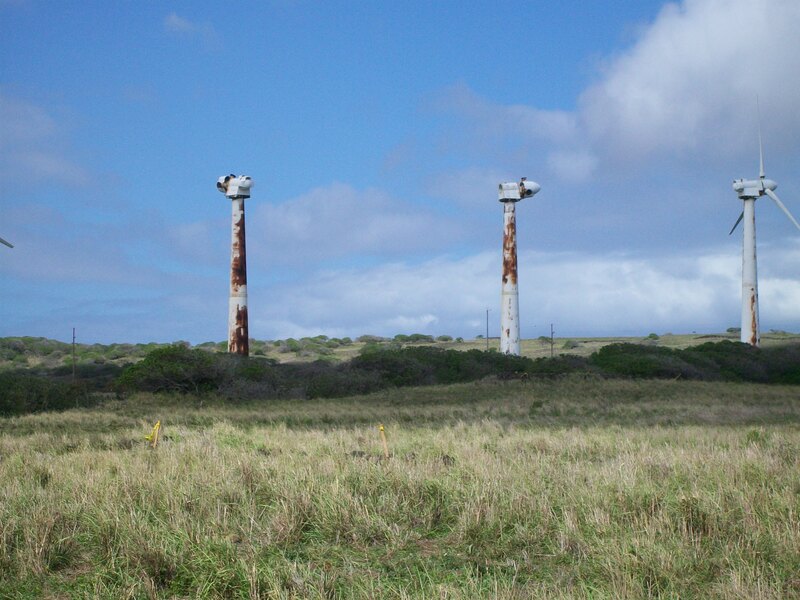 Chernobyl? Three-Mile Island? Fukushima? The truth is they don’t want to see anything. They want their electricity producing behind someone else’s house on the other side of the country. In Appalachia (part of the USA where there is a lot of coal), health care costs related to mining and burning of coal add up to 75 billion dollars a year. Then there is environmental impacts of “mountain top removal” which is used to extract as much coal out of a mountain as possible. Why did I not think to make this point (about relative pollution risk)? It is so fundamental! The evil at the bottom of the so-called rainbow is GREED = money. All we can do is keep pushing. Thank you for putting this all together and sharing. You’ve done a fantastic and comprehensive job. Very interesting – thank you. I’m not a scientist, but am I right in thinking that with energy, you don’t get something for nothing? If so, there will be adverse consequences from any means of generating electricity – a cost to be borne somewhere in the system. I think the focus on generation misses a more important issue of reducing the energy we borrow in order to fuel our costly lifestyles. We need to find ways – together – of living more lightly and harmoniously. agreed. reduction in use is the first step. Well said. I completely agree that we too easily ignore the advantages of reducing our consumption of energy. Ditto, thanks for such detailed information. I’ve been wondering why there’s always been such vehement opposition (can it truly be the visual component? ); such people are quick to point out the “cons,” without offering any other green alternatives (which as you aptly state, aren’t necessary here)…. Thanks for such detailed information – great article! It took awhile to get it together. There where a lot of questions I had. Was worth the time to have your ear. Gracias. Thanks for the article: very enlightening! The links on this story are very worth checking out for some interesting stuff also. Thanks Pit.